Many of the ideas expressed in Failsafe were presented to students – both at the university and in the meditation hall. Their feedback, helpful suggestions and sometimes boredom prompted me to refine the basic ideas. I first talked about a Failsafe in Consciousness in my 2002 book The Essential Spiral: Ecology and Consciousness After 9/11, drawing on the post Enron crash where financial analysts actually talked about responsibility and ethics. I also drew on the writings of E.O. Wilson – that despite all that was happening around us there was still an unmistakable link with nature’s systems in the human psyche. So I endeavoured to improve on the ideas floated in 2002 and tried it out on my ecology class at Carleton University in Ottawa, Canada. I had the privilege of meeting two outstanding students – Eric Smith and Paul Schlissel. They took up the challenge of mapping my ideas into diagrams and re-arranged how I addressed the components of the emerging concepts. Failsafe, due to their promptings, became more than a set of ideas. It had substance and a design based on three interconnected components. These were Innate Earth Wisdom; Counter Culture; Tipping Points in Consciousness – all of which intertwined with consciousness transformation. Can we fix the planet? This is the wrong question. Our present values and patterns of consumption are the architects of the present global ecological emergency. The right question is can we transform ourselves? My point in addressing Climate Change and Global Warming was that they were not the problem. The real problem was the mind-set that created the ecological conditions for Global Warming to explode dramatically into the lives of every human being on earth. I needed a set of interconnecting variables to link into the really crucial aspect of changing human consciousness. I suppose it is an act of faith on my part, but I feel that once consciousness changes then different questions will be asked and different solutions found. Out of the transformation will emerge the structures and institutions that can regulate global affairs without endangering all species – including our own. 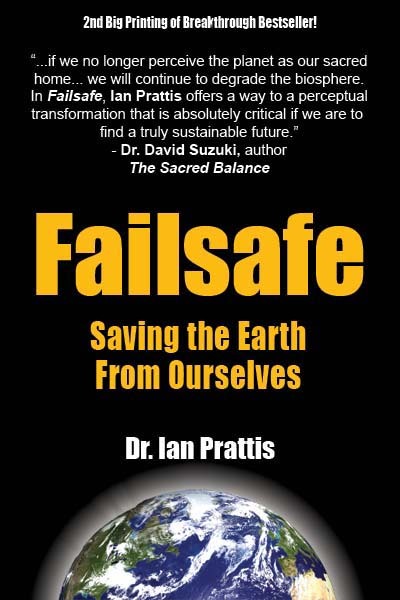 Failsafe provides understanding of global eco-crises and issues a call to change the existing world order by arriving at a deep spiritual understanding of what needs to be done. Step by step methods to transform our existing mindset are laid out to usher in a new era of planetary care, social justice and peace. Failsafe is about hope and faith and the clear knowledge that we have the capacity to get things done. There is hope for future generations to occupy a healthy planet and faith in the human consciousness to change. There is faith that we beings can awaken to the miracle and beauty of all of life. Failsafe provides examples and guidance for transformation and change. Failsafe is a critical response to Lovelock’s 2006 book “Revenge of Gaia” where he argues that the present self-regulating mechanisms of Gaia cannot be controlled by human agency. In the context of Global Warming and dire predictions for a habitable econiche for homo sapiens I present a Failsafe in Consciousness. I describe how consciousness expansion will be held in abeyance by wilful human ignorance until the global ecological situation deteriorates to a breaking point. This breaking point will then act as a catalyst, penetrating such ignorance and activating consciousness so it is propelled into expansion, deliberation and change. I drew a lot on the new discipline of Neuroscience, the Wisdom of Aboriginal Elders and the teachings of the Buddha about changing the human mind. Taming the human mind was a major issue, because to change external circumstances with technological fixes still leaves a damaging mind-set intact. If our minds are not clear and at peace, we simply pass on our disturbance and selfishness to everything we create. In the final chapter – Taming The Wild Mind – I felt it necessary to include highly personal accounts to show that Taming the Wild Mind was not easy for me. My particular journey is not for everyone – yet some form of journey is absolutely necessary for all of us – one that takes us beyond the superficial into the deep reality of our true nature. This is nothing other than old fashioned goodness, caring and wisdom coming out to play instead of the greed and negativity that stalks the mind of humanity. I started to give talks to the most unlikely audiences about all of this stuff, and found to my surprise that most of the folks listening got the drift of where I was going. Their questions and requests for clarification enabled me to sculpt the Failsafe in Consciousness concept into a more understandable form. I want to reach every man and woman in the street, as the sheer necessity of a bottom up revolution in patterns of consumption and behaviour is necessary for the Failsafe notion to kick in. Failsafe is taken from engineering, where the term is used to describe a stop lever or valve that comes into action whenever the machinery is in danger of exploding or breaking down. As such, it is a useful metaphor for what is happening globally with Climate Change. I add to the Failsafe notion – particularly the idea of tipping points in consciousness. This is akin to the Hundredth Monkey syndrome, where once a critical mass is reached then behaviour changes across the board. In other words once a tipping point is reached there is a quantum leap of energy across the population. For humanity I set this threshold at 2% of the human population. If 2% can truly commit to changing their minds and altering their patterns in the direction of voluntary simplicity, planetary care and compassion – then this is the tip of the spear that lances through the problem of Climate Change. Let’s face it – Climate Change is very dangerous to us continuing to inhabit the earth, and still we do all kinds of senseless things to not face this reality. Failsafe is by no means finished. There will be bright minds who will take it further, find loopholes in it and re-fashion it. All this I gladly welcome. I look forward to the dialogue as it helps us move on. My hope is that you enjoy the book and share it with friends. I will keep you up to date with my continuing journey as it evolves. Every blessing to each one of you.